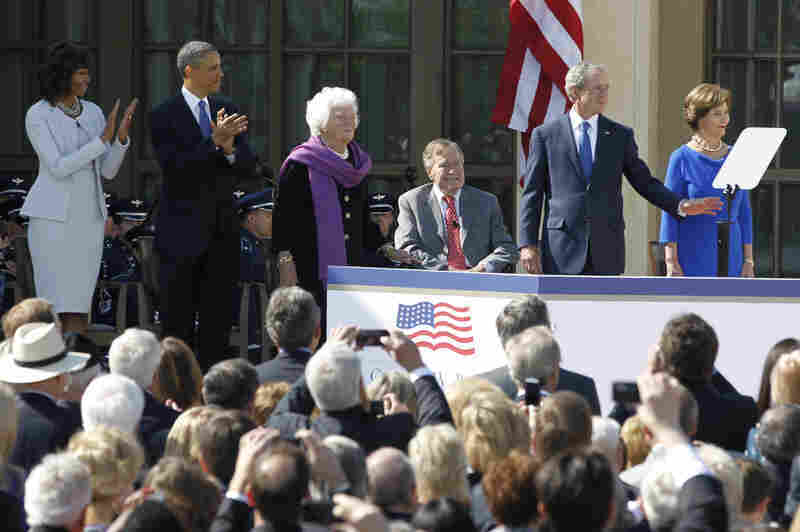 At Bush Library Dedication, Bipartisan Praise : The Two-Way The ceremony brought together five presidents — four former and the current occupant of the White House. George W. Bush's love of country and efforts to help some of the world's poorest people won him high praise. Presidents and former presidents don't gather together too often, but here's a look at some of the times they have in recent decades. First lady Michelle Obama, President Obama, former first lady Barbara Bush, former President George H.W. Bush, former President George W. Bush and former first lady Laura Bush arrive at the dedication for the George W. Bush Presidential Center on the campus of Southern Methodist University in Dallas, Texas. 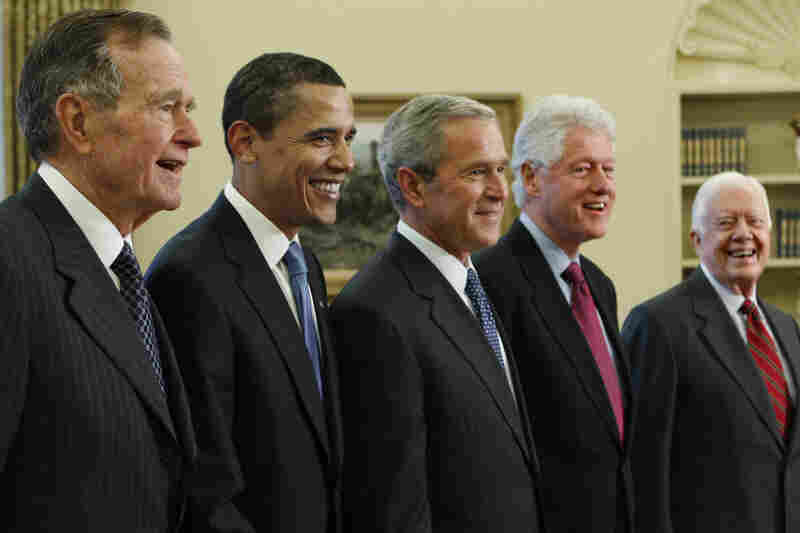 President George W. Bush, center, with President-elect Barack Obama, and former presidents, from left, George H.W. Bush, left, Bill Clinton and Jimmy Carter, right, Wednesday, Jan. 7, 2009, in the Oval Office of the White House in Washington. Left to right, Former President George H.W. 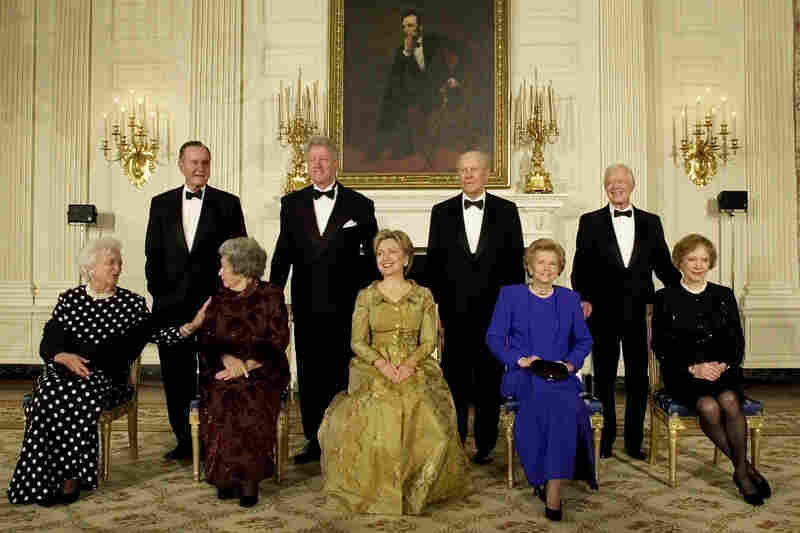 Bush, President Clinton, former President Gerald R. Ford, and former President Jimmy Carter with first ladies, left to right, Barbara Bush, Lady Bird Johnson, Hilary Clinton, Betty Ford and Rosalyn Carter during a dinner in honor of the 200th Anniversary of the White House Thursday, Nov. 9, 2000 in Washington. 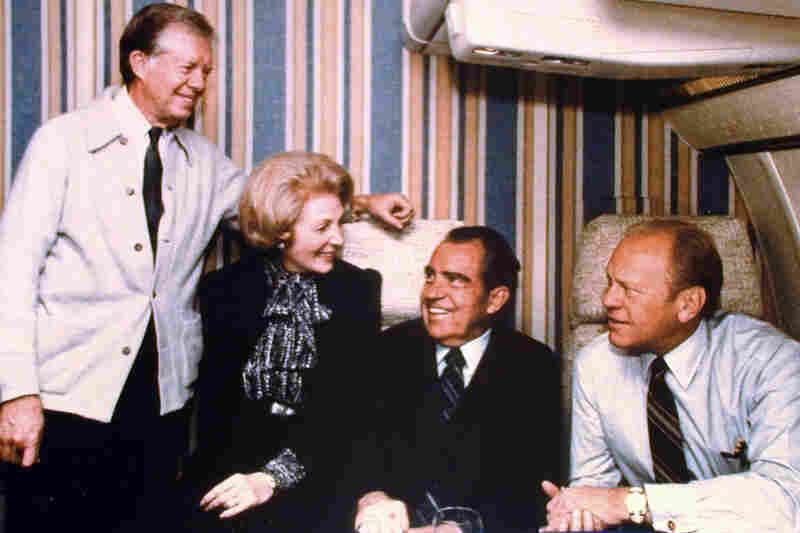 This Oct. 10, 1981 photo released by the Annenberg Foundation Trust at Sunnylands, shows former presidents Jimmy Carter, left,, Richard Nixon, center right, and Gerald Ford with then U.S. Chief of Protocol Leonore Annenberg aboard an Air Force jet carrying them to the funeral of Anwar al-Sadat. President John F. Kennedy is joined by two former presidents during services at the grave of former first lady Eleanor Roosevelt in the rose garden of the Roosevelt estate at Hyde Park, N.Y., on Nov. 10, 1962. 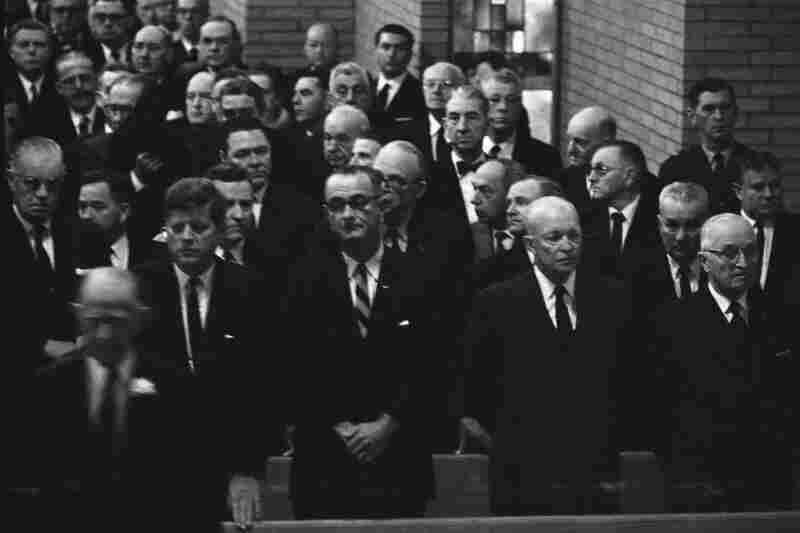 Attending the 1961 funeral services for former House Speaker Sam Rayburn are President John F. Kennedy, Vice President Lyndon Johnson, and former presidents Dwight D. Eisenhower and Harry S. Truman. 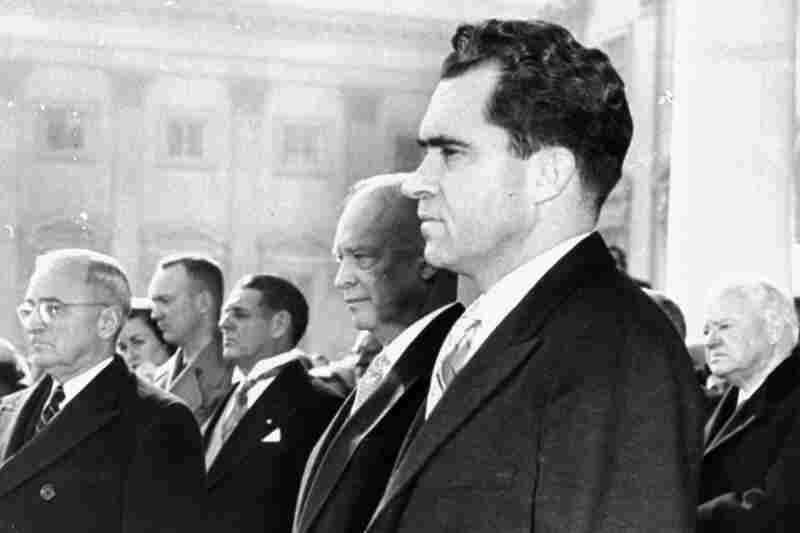 Vice President Nixon, foreground, President Eisenhower, immediately behind, former President Truman, left, and former President Hoover, right, stand on the inauguration stand in front of the Capitol, January 20, 1953, during the singing of "The Star Spangled Banner" at Eisenhower's swearing-in ceremony. 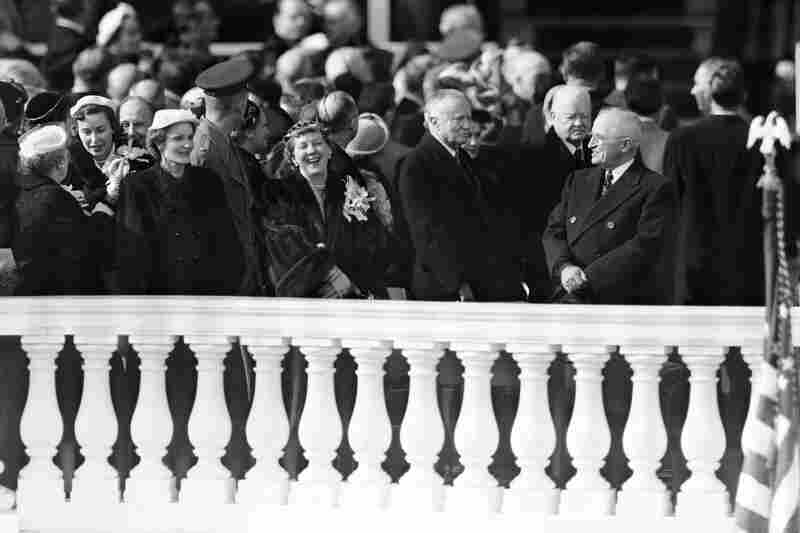 Outgoing President Harry Truman, at right, and new first lady Mamie Eisenhower, left, appear to be sharing a joke on presidential inauguration stand in Washington, Jan. 20, 1953, but ex-president Herbert Hoover, behind Truman, takes a serious view of the situation. Four presidents praised another member of their exclusive club Thursday at the dedication of the George W. Presidential Library and Museum on the campus of Southern Methodist University in Dallas. 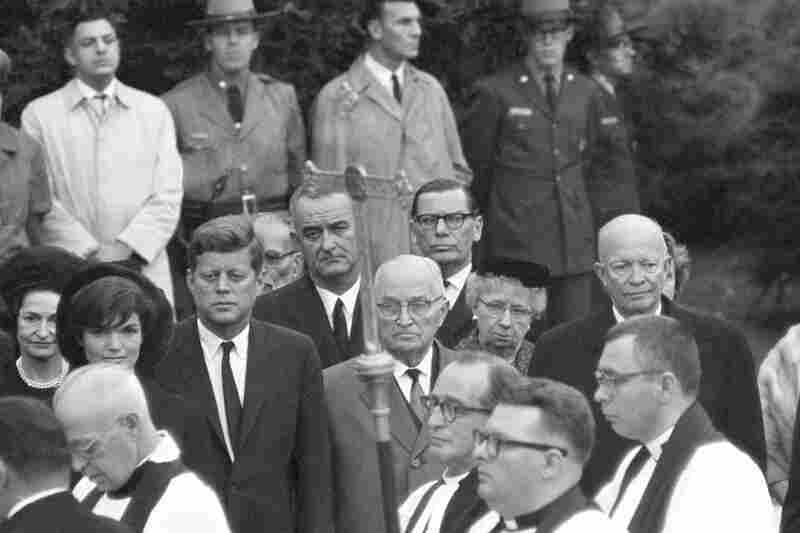 It was a sometimes funny, sometimes poignant ceremony where partisan differences were set aside. For his part, the honoree said "elected officials must serve a cause greater than themselves, defined by the convictions they hold." His guiding principle, Bush said, was that "the United States of America must strive to expand the reach of freedom." "We stayed true to our convictions," Bush said of his administration. He thanked his father, the nation's 41st commander in chief. He "taught me to be a president," Bush said. "Before that, he showed me how to be a man." Among the others Bush thanked was former Vice President Cheney, who attended the ceremony. He praised Cheney's "loyalty, principle and strength. ... I'm proud to call you my friend." There were no mentions of the deep foreign policy differences between some of the men on stage. Of the decision to go to war in Iraq and the handling of the war in Afghanistan, Bush himself made an indirect reference. "We liberated nations from dictatorship," he said. -- Jimmy Carter lauded Bush's "contribution to the most needy people on earth." Bush helped forge a peace treaty in South Sudan, Carter noted, and dramatically increased the funding for AIDS prevention and treatment in Africa. -- George H.W. Bush said how proud he was of his son. And the 41st president, who has suffered a series of health problems in recent months, rose with a smile of surprise from his wheelchair to acknowledge the 43rd president and those in attendance (who included former Vice President Cheney). -- Bill Clinton was funny and personal, saying "I like President Bush. ... I like it when we have disagreements." Clinton recalled a time when they were talking about health care and he started to discuss the German system. "I don't know a thing about the German health care system," Clinton quoted Bush as saying. "I think he won the argument," Clinton joked. -- President Obama said both he and Bush realize "being president is above all a humbling job." And the current president said he hopes that when he's out of office, people will say the same thing about him as they will about Bush: "We love this country and we do our best." Obama also remembered one of Bush's most dramatic moments, "when strength and resolve ... came through that bullhorn" on the shattered ground at the World Trade Center. "Mr. President," Obama said to Bush, "for your service, your courage, your sense of humor and most of all for your love of country, thank you very much." Earlier today on Morning Edition, former first lady Laura Bush said the library is not intended to be an institution that will change the public's opinion of her husband. "The point [is] to talk about the history of our country through the eyes of the president," she told NPR's David Greene.